This is my favouritest of all curries, except perhaps the delicious winter chochchori. 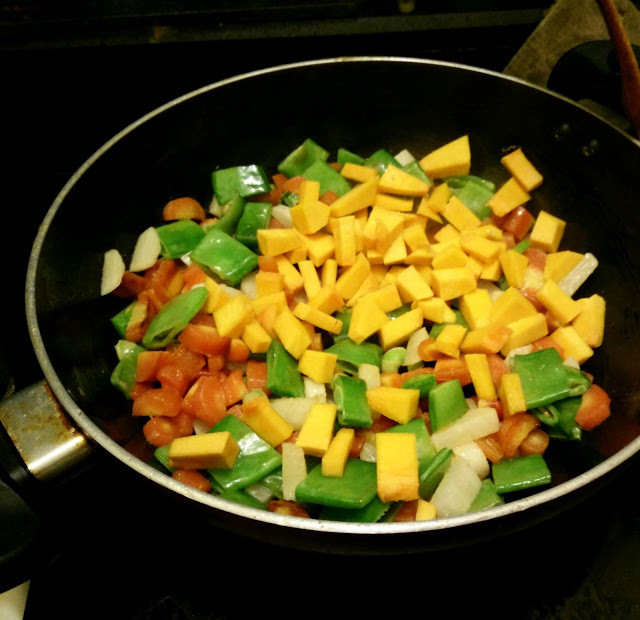 Predictably, it has no spices apart from a dash of turmeric, and the five-spice mix for tempering the oil. 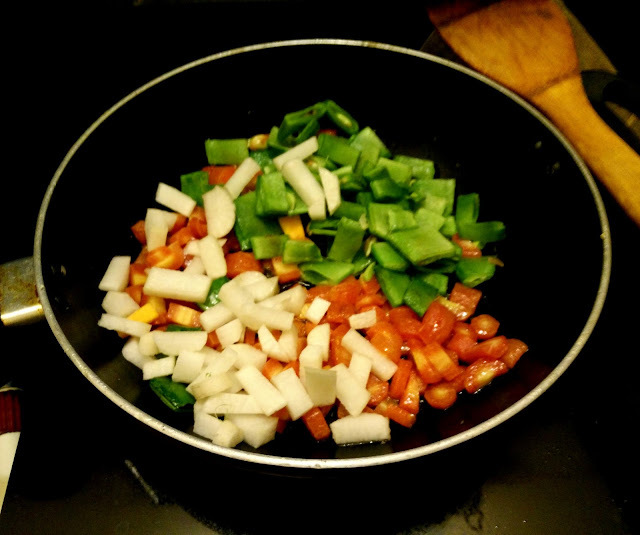 NOTE: Because I cook on an electric stove-top (and "induction" stove, if you will), I no longer have the convenience of throwing the vegetables into the wok and having them perfectly sautéed in two minutes. Which is why, going against tradition, I save adding the tempering till all the vegetables have been lightly fried. So this is how you make it. First, wash and chop the vegetables. 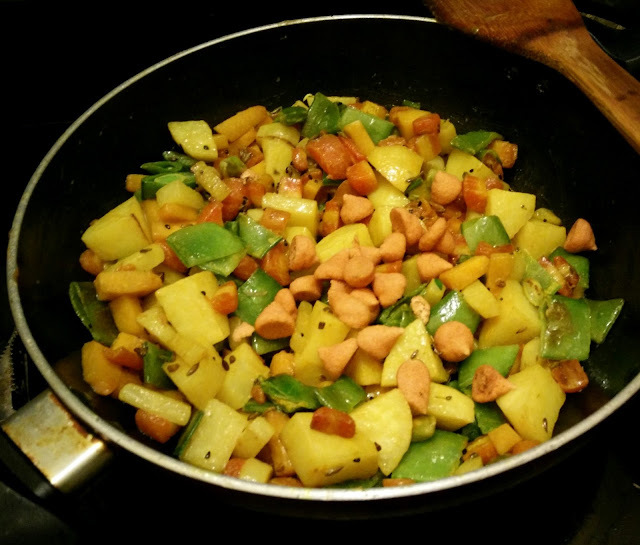 Although called a panch-torkari, or a five-veg curry, this is a scrap stir-fry that can take in as many vegetables as you can throw at it. This time, I've used two large carrots, a generous handful of the flat broad beans (sheem in Bangla), the remnants of a pumpkin (say about 70gms), one regular white radish, and two medium potatoes - all chopped in pieces no larger than an inch. Pour a glug of oil in the pan (or, if you're lucky, in your regular stove-top wok). Once its hot, add the carrots, the white radish, and after a minute of tossing, the sheem, and then the pumpkin. 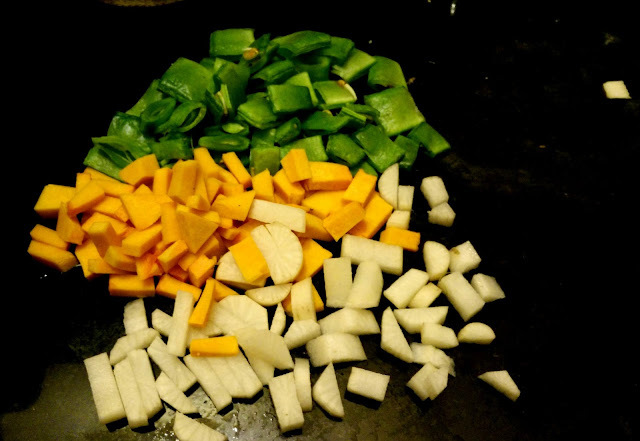 Then, once the vegetables have been tossed intermittently for long enough for the mix to become aromatic, (on my stove it takes about ten minutes; on a wok about three) lower the temp to medium. 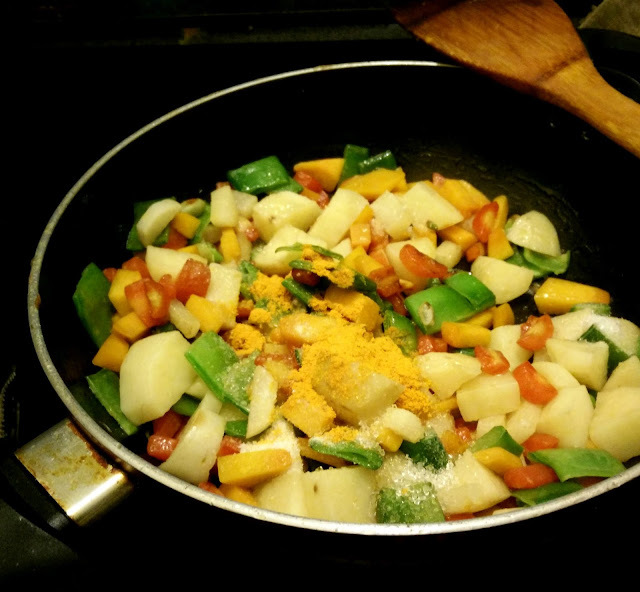 Make a little well in the middle and add half a teaspoon of the Bengali five-spice mixture. Now toss well to mix it with the vegetables. Once it's been folded in well (you'll be able to smell the sweetness of roasting fennel seeds), add a teaspoon of turmeric, and salt+sugar to your taste. For the amount of vegetables I had this time, I added 1.5 teaspoons of sugar. Unlike most, the panch-torkari is a curry that blossoms in the extra sweetness. 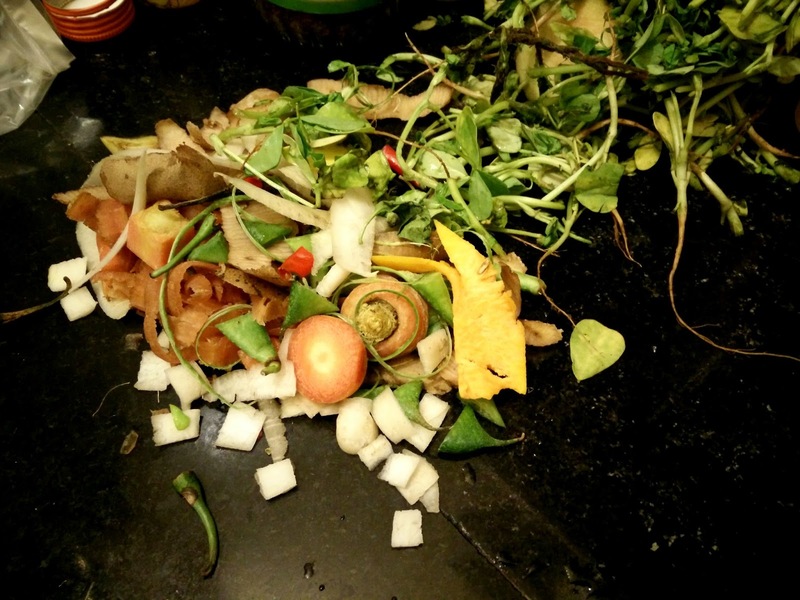 Now add a cup of water - or enough water required to cook your vegetables - to the mix. Give the pot a gentle swirl with the spatula, reduce the heat to medium-low, and let your torkari cook. In the picture below, you'll see I've added a handful of boris before adding the water. Boris are best fried separately and added as a garnish, otherwise they lose their crunchiness. However, if you forget to fry them first, and aren't too exacting in your tastes, feel free to add them with the salt and sugar and then cook them in the water. This torkari is best eaten, so people say, with a thin mushur (red lentil) daal and the juice of green lemons in summer. However, I love having it by itself, like a vegetable stew of sorts, or with our two carbohydrate staples: rice and rooti. If you dry it out on the wok, it also serves as a wonderful filling for vegetarian roll-ups or left-over sandwiches. Given how many vegetables go into this, the scraps are wonderfully colourful. Here's what mine looked like after I was done cooking. Panch torkari with panch phoron is also one of my most favourite bengali vegetable dishes. I have made this with any and everything but I always like to keep the pumpkin, jhinge, begun, bori, and alu (sweet potato in winter is also great)! Happy new year sweetheart to you and M! How are ze dogs? Thanks for sharing the information, I am pretty much impressed with your good work. You put really very helpful information. Keep it up. It looks so delicious, healthy and yummy, simple and great recipe.